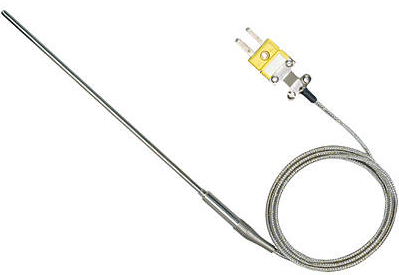 A thermocouple is a very common element for measuring the temperature of any application. We hereby provide a brief of the types of thermo couple and our range of thermo couple wires. Thermocouple sensors consist of two different metals and is used for measuring temperatures. 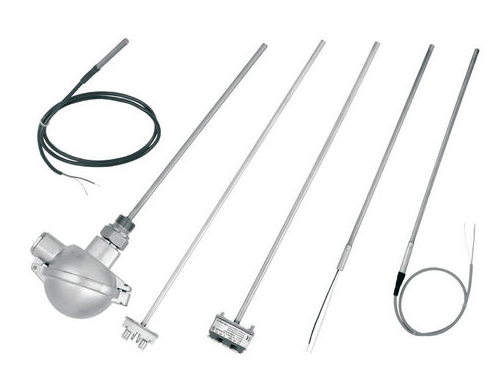 This is the basic form of temperature sensors utilized for all type of temperature measurement. Different metal combinations usually used are Nickel/Platinum, Platinum/Rhodium, Tungsten alloy etc. It does not need any external voltage. The principle is that it produces a small voltage in proportion to the temperature which can then be converted into a digital signal. This voltage will be proportionate to the temperature. This can be displayed on a display device. A combination of two different metals produces a small voltage based on the variation in temperature. The voltage so generated can be termed as Thermoelectric voltage. Since this is a minute electric voltage, there is a limitation on the length of the cables in relation to the accuracy of the measurement. For longer distances, the accuracy is compromised. Hence it is preferred that the instrument is properly calibrated after installation to account for such corrections. Proper compensating cables are used to obtain more accurate results. How to measure Temperature using Multimeter and Thermocouple? 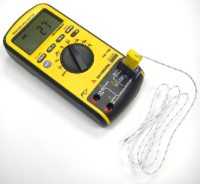 One of the simplest methods to measure the temperature will be by use of a Multimeter which can connect a thermocouple. There are many multimeters which can measure the temperature using thermocouples. 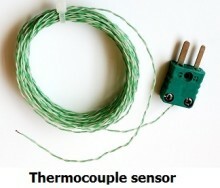 Any normal K type thermocouple can be used to measure the same. This is the simplest way to understand the operation of the same . These type of multimeters will have selection knobs to either Degree centigrade or Degree Fahrenheit. The thermocouple is not generally connected to the device and is supplied separately. When you want to measure the temperature of any surface using this multimeter, simply insert the pin of the thermocouple to the multimeter as shown in this image. The other end of the thermocouple is the exact point which needs to be placed on the surface for which you intend to measure the temperature. Now the display screen of the meter will automatically indicate the temperature. What happens inside the meter is that the thermocouple generates a small voltage which is converted into corresponding temperature indication on the display screen. Vacker is supplying wide range fo multi-channel data loggers manufactured by MSR Switzerland, Graphtec Japan, Next Italy etc. These data loggers take input from various sensors including thermocouple which are also being supplied by us. 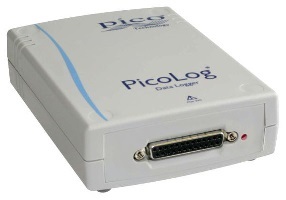 The data of all individual sensors are recorded in the data logger. 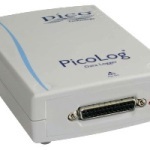 Please see our pages on Multi-channel data loggers for more details. Thermocouple wires & cables come in various type such as J Type , K Type etc. These are as per following international classifications and are supplied in different lengths. The major difference in different types as listed above are the different metal combinations used which produce different characteristics. The picture shown to the right is a typical sample.It consists of a sensor at one end(the narrow end where the two wires are joined). The other end is a pin which will be inserted into a multi-meter or other measuring and controlling signals. The pin has positive and negative terminals which are having different widths. It may be noticed that one of the two pins is wider than the other one. This helps in inserting correctly. different types. Selection is based on different parameters including the measuring range and required accuracy. For suitable selection, the main considerations are the range of the temperature, the range at which more accuracy is required, the environment of usage and length of the cable required. Armored and Non-Armored Single pair & Multi-pair Extension Cable and compensating cables (also known as compensating wires) are used for taking the readings to longer distances. The cables are available in either 2, 4, 6, 8, 12, 16, 20 or 24 pairs. Also, there are different color codes for easy identification. 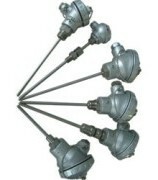 These are available from 60 cm to 500 meters with extenders. 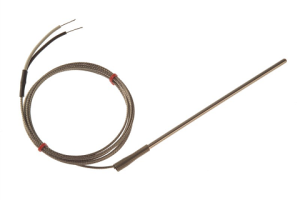 Thermocouple probes are having a long probe with a connecting cable. The probe can be inserted for the measurement and the reading can be taken through the cable. Vacker manufactures a wide range of thermo-couple elements for various industrial applications. These are available in certain standard types and also are custom made to suit your requirements. These are for the industrial connection having probes with a protective head at the end of the sensor probe. Th e probe comes in various lengths and types and goes into machinery, furnace etc. The head of the probe will be fitted outside the machinery. There will be connections which can be utilized for analog and digital displays, control, temperature transmitter, switching etc. The heads come in few standard sizes and the probes come in varying length and thicknesses for a wide variety of applications. This is especially useful for closed tanks, machine parts etc. with air tight protection. The head will be tightly fitted and the probe will go deep inside with lengths such as 1.5 meter, 2 meters etc. The head will have connection terminals for electrical connections. Explosion proof models also are available for such applications. This is simply a digital thermometer with an external probe for measuring temperature. As per the above principles, the thermoelectric voltage produced is converted into a digital display within the instrument. The readings can be seen on the LCD display screen. The range of measurements can be anywhere between -200 °C to 1350 °C. However, it is generally used for the normal range such as -40 °C to 100 °C, which is generally accessible for a human being. 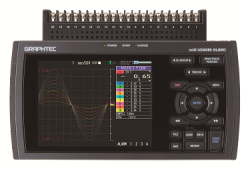 There are different types of multimeters available which will measure various parameters including temperature utilizing the different type of probes. Also, many models can measure using infrared rays which will be less accurate. Multimeters come with different probes which can be inserted as shown in this image.